2:52 - What happened with BestMeta? 6:47 - How do you teach people how to cast games? 18:00 - What kind of game is TobiWan working on? 23:45 - Why are Battle Royale games are going to die out? 28:35 - Are games going to keep trending towards more casual experiences? 39:00 - How much longer does Dota 2 have? 42:56 - What's wrong with the Dota 2 Pro Circuit? 55:32 - How could TI be more International? Toby "TobiWan" Dawson is a well-known Dota 2 caster and the voice behind some of the game's most iconic plays. He's also got his hands in plenty of things behind the scenes, like content to help train the next generation of casters, an entirely new video game he's working on, and formerly, BestMeta — a cryptocurrency for esports content creators that he recently left behind to focus on other projects. 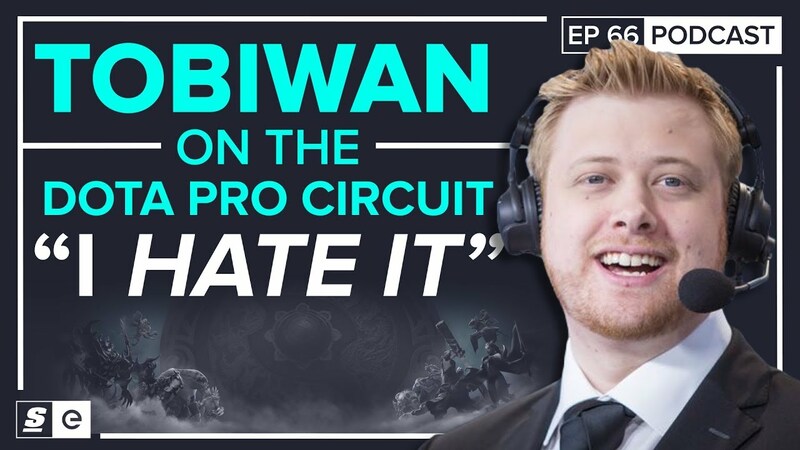 TobiWan joined theScore esports Podcast this week to talk about some of those projects, shared his opinions on why the battle royale genre doesn't have long to live, discussed how long he thinks the "Big Three" esports can last, and went over everything that's wrong with the Dota Pro Circuit. "I hate it," TobiWan said when asked about his stance on the Dota 2 Pro Circuit. "The primary issue I feel with the current [Dota Pro Circuit] system is the only people who are being rewarded are the players. And not saying that they shouldn't be rewarded, but when you think about it, to run a major, it has a $1 million prize pool, the tournament organizer must raise $500,000 for this. And the only money that Valve gives is the money to make it a Major, which is the $500,000 to the prize pool. Now tournaments before them, the biggest ones you were having were 250,000 to 300,000, unless China was bankrolling them. So then you ask, where is the extra money coming from?" TobiWan pointed out that the money that is funding these enormous prize pools is coming out of the tournament's production values, which ends up harming the fans. It also means that tournament organizers effectively get to "buy" a Major, which removes some of the prestige from winning a Major. Meanwhile, TobiWan also pointed to the rise of games like PlayerUnknown's Battlegrounds and Fortnite as a reason for the decline of Dota 2's playerbase. The way he sees it, every game has to die out eventually, and while it's hard to say exactly when that time will come for Dota, it's going to come sooner rather than later if Valve can't keep the game fresh. "Some people are saying Artifact is meant to be the next version for Dota, and maybe it will be a place for the community to shift to, but it won't be the next version of Dota," he said. "But this is where you go next. CS:GO has run strong, but how long is it going to last? Everything lasts for a very short span of time, and this is always affected by software, by technology, by a gamer getting bored." And while it looks like PUBG and Fortnite are where players are going right now, TobiWan doesn't think that's going to be the case for too long He sees a pretty short shelf life for the Battle Royale genre, and it's not because support is going to dry up. "Quite simply, because rush. Only a certain amount of people really want to have that experience. I feel like everything is like a roller coaster," he said. "I don't always want to be going at high speed straight down then being kicked into a vertical climb. To do such a thing, it doesn't feel natural, and you as a player will feel burnt out eventually, unless all you're doing is sitting down for a half an hour each day, which, for a lot of these games, people are not." TobiWan also doesn't believe the future of these games is in esports, at least not for Fortnite, which he says shouldn't even attempt to have an esports scene. "You've got two very different audiences which are out there, and PUBG obviously try to push for esports even though the game—it's the meme but it's accurate—is not ready in its current form to be competitive because there's too much RNG in there. And then you have Fortnite, which I hope to God doesn't try to get competitive...the main reason I bring up Fornite as well as PUBG is that one game can be really well design for esports, the other should not." All that combined is why Tobi is working on a game of his own. He says he's been frustrated and bored by the games out there right now, and it's led him to start working on what he said is a sandbox-style multiplayer game. "I kind of wanted to build a game because I see a lot of developers doing some very interesting choices, and I kind of got to a point where I just start to dislike the games I was playing. They had a certain amount of play value, but then it just dropped off drastically, and it always required like huge patches, huge changes or things like this to change that up," he said. "And I also feel like a lot of the games were not really designed to work with what I believe the upcoming and probably going to be the biggest market out there and that's the influencer market. Which in my view will probably take over most of the budget resources from esports once people understand that. So I kind of wanted to design a game that would give the communities which are out there a great hub to play from and to give them something which means something for a long period of time."